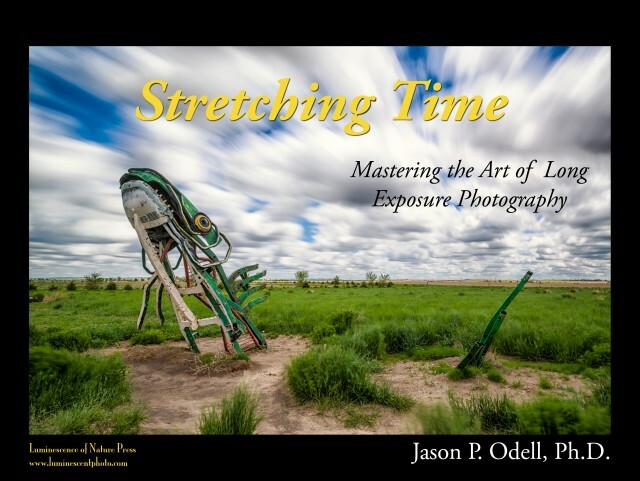 The complete guide to long exposure photography, by Jason P. Odell, Ph.D.
I’m pleased to announce the immediate release of my thirteenth eBook, Stretching Time: Mastering the Art of Long Exposure Photography. This printable, high-resolution PDF eBook is the culmination of several years of work and research into the creative and technical aspects of long exposure digital capture. From exposure theory to composition and post-processing, Stretching Time is a complete resource for anyone interested in creating dramatic long exposure images. I hope you find this new guide informative and enjoyable. I recently attended your online works shop on long exposure photography. What is the difference in content between the online workshop and the e-book you are currently offering? Is there more content? The title “Stretching Time” is the same but in your e-book offering it is titled “Stretching Time….Mastering the Art of Long Exposure Photography”. The title I have does not offer the word “Mastering”. Thank you. The overall topics are similar to the online class you attended. However, the eBook allows me to go into much more detail on filters, accessories, and Photoshop techniques that I didn’t have time to cover in the online class. It has more screen shots and complete step-by-step instructions on a variety of techniques, including post-processing. You can download the complete Table of Contents from the product page and see what the eBook covers. I love all these pictures!I found a picture of a tree done with long exposure lightning. Can anyone tell me what happened to that tree after the shot was taken? it is so interesting and I am just trying to understand a bit more on the subject about before and after efects.any help with this would greatly be appreciated.